Multi-touch technology is rapidly migrating from smartphones and tablet computers to test & measurement instruments. One of the main reasons for this trend is that multi-touch screen manipulation is three times faster than with knobs and buttons, greatly increasing operator efficiency and productivity. This three-fold increase in productivity is made possible because two-point touch technology condenses multiple touch-and-click operations into a single fast swipe action. In addition, multi-touch technology has become intuitive to most all engineers due to the proliferation and widespread use of smartphones, tablet computers and other handheld electronic devices (Figure 1). Therefore, little or no training is required to introduce multi-touch to the end user, resulting in quick adoption and immediate gains in productivity and effectiveness. Figure 1: Multi-touch technologies implementation in tablet PC and data acquisition enables remote control and data analysis through Bluetooth or WiFi. Testing facilities and research laboratories often find themselves drowning in data, and struggling to use data in meaningful ways to improve operations. The most common method for viewing and analyzing information is through data acquisition and oscilloscopes. 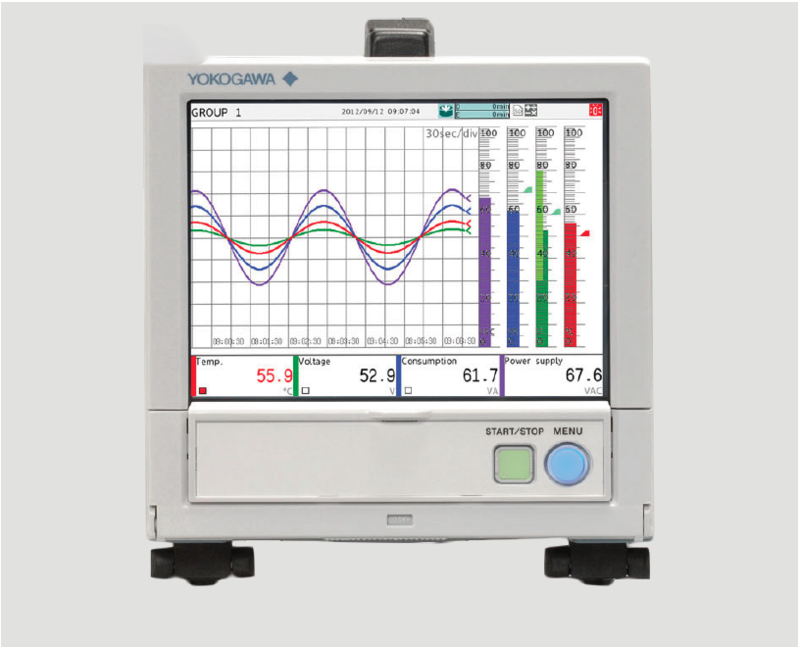 These instruments use color graphical displays to allow operators to view input signal data, and to control equipment or processes in real time. More advanced systems can securely save data for viewing on demand, this is particularly useful for reviewing historical data, and comparing this data to present conditions. Modern data acquisition instruments are replacing old recording technologies such as pen and ink chart recorders. The latest generation instruments benefit from secure high capacity data storage, able to save months or even years of historical data within the device. Operators can view and study this data without having to use a separate PC and special software. Although data measurement and recording techniques have improved dramatically over the years, producing greater amounts of useful data, analysis techniques and operator interface technologies haven’t fully kept pace. Traditional screen navigation techniques such as knobs and buttons have proven to be an inefficient way to view and analyze large amounts of data. Touchscreens have been recently introduced and are an improvement, but most employ single-point technologies that only allow an operator to touch and manipulate a single screen object. In many cases, a single touch will then activate a function or select a menu to move to a more detailed screen, with multiple touches often required for even relatively simple tasks. Well-designed touchscreen interfaces allow for faster direct-selection of menu icons and other items than is possible with knobs and buttons, systems that produce a large amount of historical data still require the operator to constantly tap or touch a screen control to navigate to an area of interest. Instead, a better method is at hand, and is now available in leading data acquisition systems and other related products. A two point touchscreen supports swipe and pinch operations. 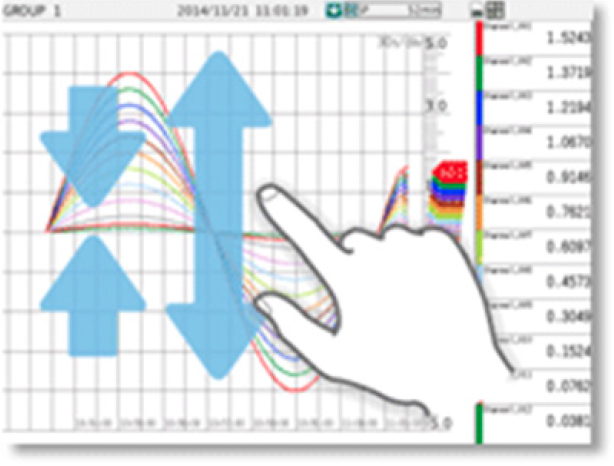 With a single finger, an operator can swipe a trend screen and traverse across the horizontal time scale until a particular area of interest is reached (Figure 2). He or she can then use two fingers to pinch the screen in or out to compress or expand the time scale (Figure 3). This allows trend data to be examined quickly in an overview fashion, and then investigated in detail. 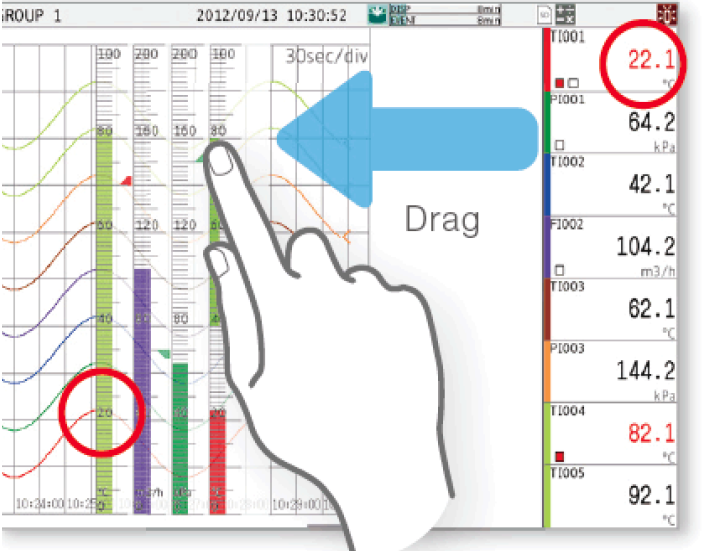 Figure 2: Using a multi-touch swipe operation, the operator can quickly scroll through a trend screen to examine and analyze large amounts of historical data. An operator can also rapidly scroll through historical trend text-based data by swiping the screen, in the same manner that they would rapidly scroll through a contact list on a smart phone. In many cases, this is a much faster way of finding data than the traditional method of typing letters or numbers and performing a search function. Another productivity enhancing feature is the ability to quickly add short handwritten notes and symbols directly on a trend display or other screen with a stylus, or even with a finger. One simply presses a finger to the screen and writes a note or creates a symbol, similar to finger painting. As a matter of fact, the entire user experience with a multi-touch product suddenly becomes very familiar since operators are already interfacing to their smartphones and tablet devices in much the same manner. This reduces the learning curve required to master the operation of a new data acquisition product, while at the same time encouraging the use of the features tailored around optimal touchscreen navigation. Finally, multi-touch imparts a “fun-factor” to routine tasks and operations, increasing operator involvement and productivity. But as with all new technologies, there are some caveats that must be examined prior to implementation. 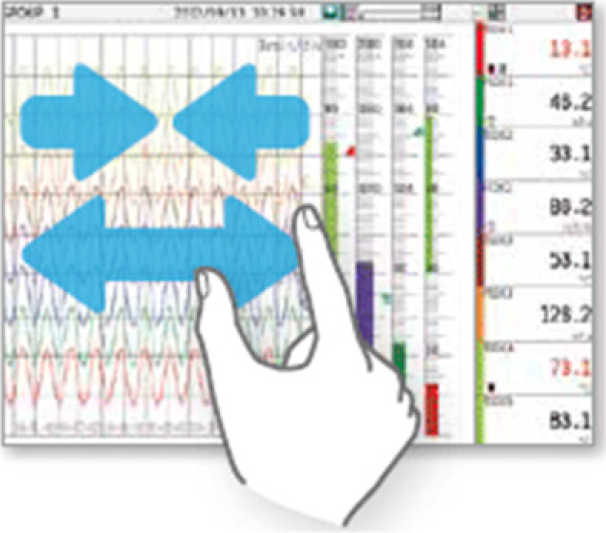 Figure 3: Two-finger pinch operation allows trend data to be quickly examined in detail with pinch in, or an overview basis with pinch out. The data being analyzed must be accurate, reliable and trusted. Once trusted data is available, it must be delivered to the viewing device at intervals frequent enough for meaningful analysis. Large amounts of data also need to be stored and easily compared to current operations as this greatly improves analysis. Although multi-touch improves the productivity of many operation interactions, single-touch on-screen keyboards and pointing devices still have their place. For example, scrolling through a list of up to hundreds of variables is generally faster with multi-touch, but searching a database with thousands of entries will usually be quicker with traditional type and search. Best results in terms of high productivity and ease-of-use will continue to be found through the judicious combination of multi-touch and single-touch technologies, so both should be supported, as in the following application examples. A practical example of the advantages of multi-touch and other technologies for data analysis is a panel-mount data acquisition station (Figure 4). Its mission in life is to measure process signals with high accuracy and repeatability, and to clearly provide visualization of this data to operators. Abundant and secure local data storage is a must for future data review and analysis. Last but not least, the station must support easy data transfer to the PC environment, so that data can be permanently stored and, in some cases, further analyzed. The most advanced data acquisition stations are fully integrated devices offering a long list of premium functionality such as modular universal inputs, SD flash memory and USB portable media support, topped off with a very familiar-feeling touch screen operator interface. Intuitive color graphics present information clearly, with single and multi-touch operation available for all settings and data display navigation. Operators can watch a single overview screen showing all channel data, and then touch any channel in an alarm condition to jump to a more informative trend screen. On this real-time trend screen, a simple swipe will replay recent historical trend data leading up to the alarm, during, and after the event, with min/max data indicated. Another touch and swipe action takes the operator to deeper historical data. This no-compromise performance is a requirement for many applications, made easier thanks to multi-touch technology. The full depth of trend history including hours, days or even months is available in this manner. Add standard Ethernet connectivity that allows data monitoring using a web browser, email messaging and other convenience functions—and these advanced data acquisition platforms offer the user a very powerful alternative to complex software-based data acquisition platforms employing older single-touch screen interactions. 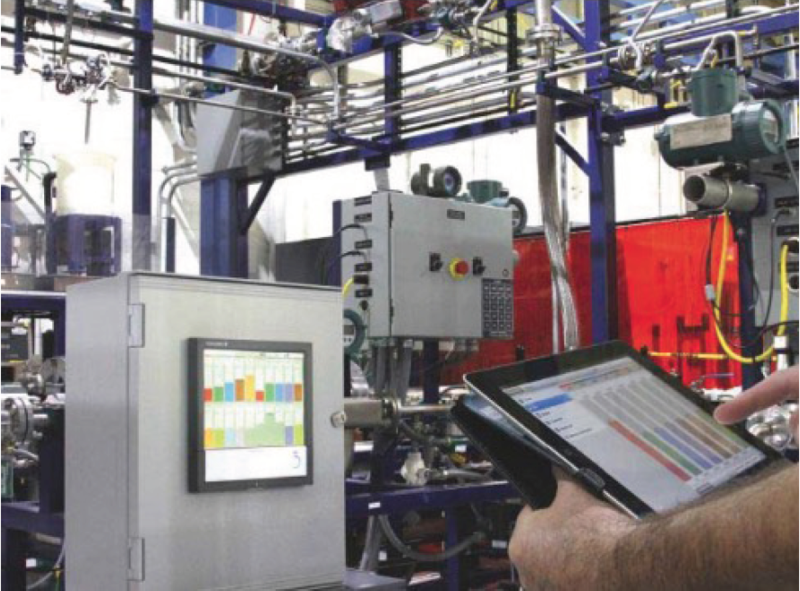 In one application in an engine test cell, a paper trend chart captured data that proved temperatures were in specification during each product heat cycle. Operators would hand-write batch and other text information on the chart, associating each product batch with the temperature data. To meet latest quality standards for this industry and improve operator productivity, a digital electronic recording system was installed to acquire, store and produce secure, tamper-resistant data files containing traceable batch and temperature data. A new data acquisition station was implemented with a touch screen operator interface to fulfill these requirements. The station allows the operator to see the precise temperate data on graphical displays, and to scroll through historical trend data by simply swiping backwards on the real-time trend display. He or she can also quickly input important text information with the touchscreen keyboard, or hand-write messages using a stylus. Data input is now performed with much greater speed and accuracy, and an audit trail is established that links the responsible operator with the batch record. Multi-touch technology has enabled smart phone and hand-held tablet devices to change the way people communicate, navigate the Internet, and interact with the countless applications they use on an everyday basis. This technology has brought the same level of convenience and intuitive feel to specialized data acquisition and control products. Clever design of plant data acquisition and other systems that takes full advantage of multi-touch technology, and the deployment of specialized apps in smart phones and tablets that support these products, are changing the way operators interact with and interpret plant information.